Health and safety signs and signals are commonplace in work settings across Glasgow to ensure compliance with OSHA requirements. Here at PPE Industrial Supplies we stock a comprehensive range of types, sizes, and adhesive options to suit your needs. The importance of a well placed safety sign cannot be overestimated. After all, what’s the point of an advisory sign if nobody can see it? Our comprehensive PDF catalogue highlights the areas you should place signs, according to the most recent OHSA recommendations and requirements. 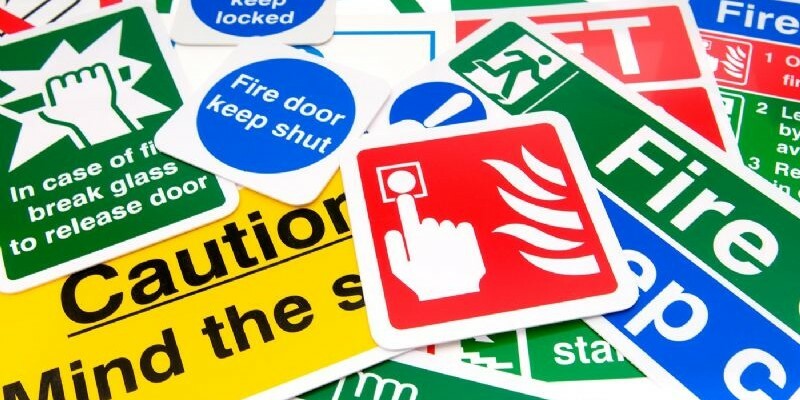 Not only do we sell the expected wide range of fire signs to mark the location of fire alarms, fire escapes and fire actions, we also sell a range of optional - but very useful - signs to help your guests and visitors become acquainted with your systems and processes. These include desktop signs to alert visitors to any planned fire alarm tests, which can be easily amended on-site when required. The largest city in Scotland, Glasgow is a thriving industrial and financial hub. The construction, manufacturing and shipbuilding sectors require durable safety signs, while services such as entertainment and music demand a wide range of PPE. Companies linked to the Glasgow and Prestwick Airports and the Firth of Clyde also benefit from the availability of quality gear in Glasgow. At PPE Industrial Supplies, we provide Glasgow business with advice on choosing the best safety signs. In addition to supplying an excellent selection of products, we can customise your safety signs and deliver it to you, whether you are based in the city centre, the East End or anywhere in the Greater Glasgow Area. Ensuring workers and visitors are safe from electrical hazards is of paramount importance, and we can help with this task through our wide range of hazard signs and posters. Our range includes danger and warning signs, as well as electrical warning labels made of tough and non-rip polypropylene. We also offer PAT testing cable wrap labels which comply with IEE regulations ensuring all information can be written on them using a standard pen. These non rip labels are available in green and red to indicate if the appliance has passed or failed the safety test. Our comprehensive range of barriers and warnings which allow businesses in Glasgow to manage the flow of people and traffic means you don’t need to look anywhere else to get what you need. We stock a range of plastic, polyethylene chains to go with our universal chain posts and bases, which themselves are highly visible and corrosion proof. For something a bit less permanent, we hold retractable banners which can be fixed to a wall and used only when required, taking up less storage space indoors than poles. To guide the flow of people, we also offer signs and floor graphics to ensure regulations are adhered to at all times. If you would like to create your own safety message or promotional advert, we can help you with that. Just supply your own message, logo or photograph for a personalised product with PPE Industrial Supplies. Get your free safety signs quote today.